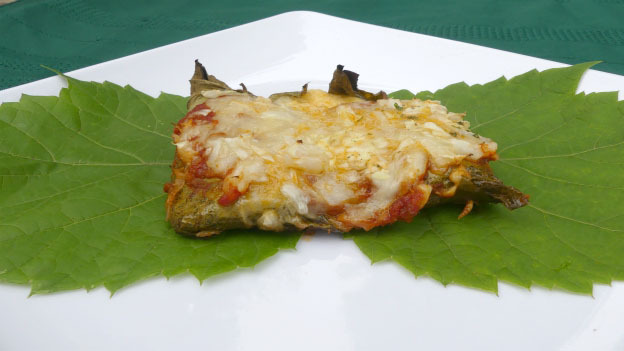 Bean burritos wrapped in nutrient-dense grape vine leaves makes this meal a very healthy choice. Saute three quarters of the chopped onions. In a bowl, mix the can of refried beans,the quinoa, sauteed onions, and taco seasoning. Place some of the burrito mixture in the centre of a grape leaf, roll and place on baking sheet with the folded side faced down. Repeat with the remaining leaves. Once arranged in two rows, spoon some spaghetti sauce over the folded leaves. Take the remaining onions and place them over the burritos. Sprinkle some grated cheese over the burritos then season with garlic salt and pepper.